Cebollas encurtidas or pickled onions are the most basic curtido and are served with a lot of different dishes, they are basically the same as the onion and tomato curtido but without the tomato and cilantro, though cilantro is sometimes added to onion curtido. 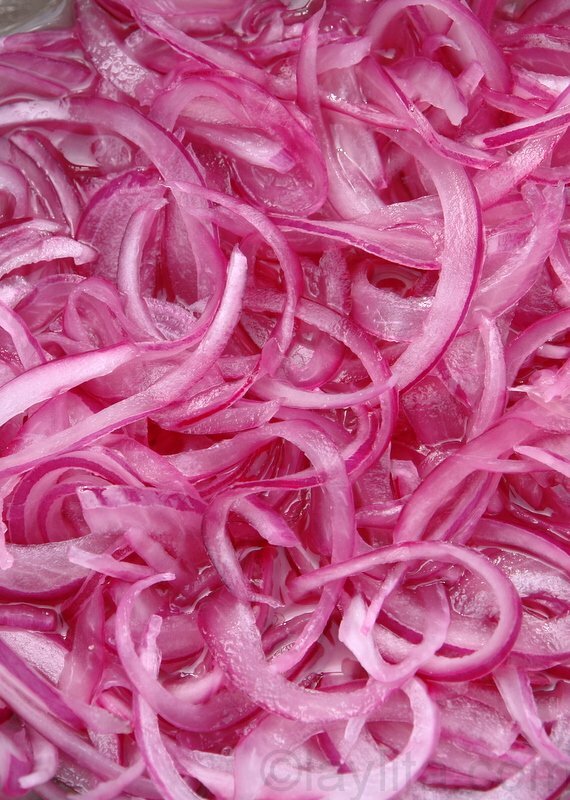 Occasionally onion curtido will be made with white onions , but most of the time they are made with red onions, though in Ecuador we use a different variety of red onion, called cebolla paiteña. It is smaller and slightly spicier and almost looks like a large shallot, but unlike a shallot it doesn’t get as sweet when cooked. 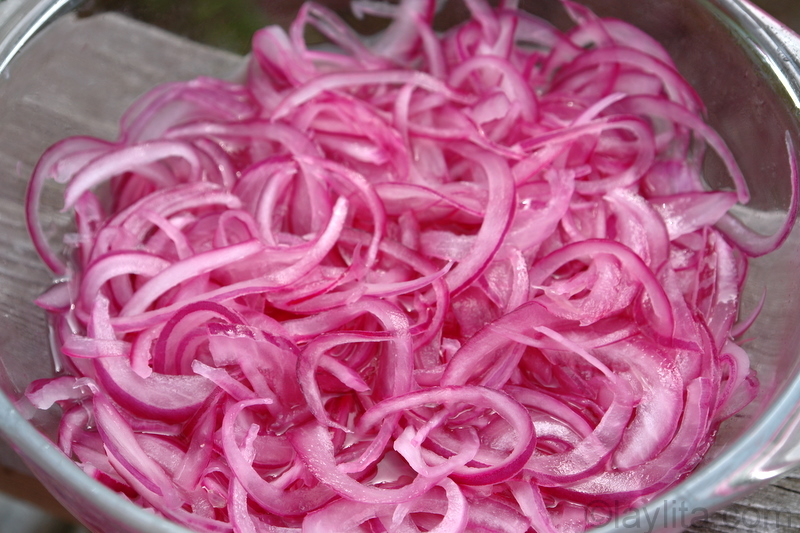 Recipe for lime pickled onions or cebollas encurtidas, these Latin/Ecuadorian marinated or pickled red onions made by marinating thinly sliced red onions with lime juice and salt. Add the lime juice, salt and the oil, and mix well. Cover the onions and place in the fridge, the onions will start to turn pinkish after about 3 hours, and will turn very pink if left overnight. Taste again before serving and add salt if needed. When I buy red onions to make curtido I try to find the smallest ones possible, it makes it easier to eat when the you don’t have extremely big slices of onion. There are plenty of versions of pickled onions, some add a little bit of sugar, vinegar, etc, but the Ecuadorian method is the most straightforward way I’ve seen to make them. This is one of my favorites, and I use it for many things. I even chop this up and add to tuna fish salad for sandwiches or tacos. 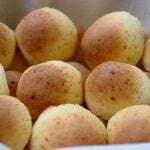 Excellent recipe – I have made these about 10x so far. Sometimes I substitute white vinegar for lime juice if out of limes. Lime juice is better though. For those considering but thinking since you don’t like raw onions you will not like this, I would recommend trying it. My wife detests raw onions of all kinds. She loves this recipe. Thank you so much! I was looking for this recipe for a long time! Now if only I can find the recipe for ecuadorian tuna mousse…. 1) Toast the allspice, bay leaves, cloves, and peppercorns until fragrant. Char the habanero over an open flame to bring the fruity flavor forward. 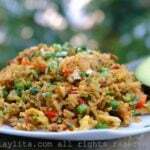 2) Place all of the ingredients EXCEPT the onions in a deep stainless steel saucepan and bring to a boil. 3) Lower to a simmer and cook for 7 minutes. Remove the orange and reserve. 4) Slice the onions and add to a large bowl. Juice the orange over the onions. Pour the hot mixture over the onions and stir well. 5) Let come to room temperature then cover tightly and refrigerate up to a week. Allow the onions to warm to room temperature before eating. They are not as appetizing when they are cold. Hi Laylita – can this be stored? If so, how and for how long? Thank you! Hi Jessica – I’ve kept them for 2-3 days at the most, refrigerated and covered. We eat them very fast around here and I make them very frequently. I was kind of skeptical first not having any sweetness was introduced but guess what? I was totally wrong! Since I made this pickled onions, this is must to have to enhance most of my dishes. Thank you and thank you!! Ely, I know exactly what you mean, sometimes I’ll be eating a dish and it feels like it’s missing a little something, so I just add some cebollas encurtidas and it fixes it. Its amazing how adding this to anything immidiatly transforms it into a down home ecuadorian meal. Well… not to anything, I’m sure it wont go good with Cream of Mushroom Pork Chops but you know what I mean hehe. Yum! My favorite vegetable fajitas at a restaurant in California always has pickled onions. They are so tasty, I’ve often thought of making them myself, but never came across a recipe. Now I have. Thanks! I’ll be sure to try it out.